be quiet!, market leader for PC power supplies in Germany for six straight years, is introducing their innovative new fan series SilentWings 2. With advanced new features such as exchangeable mounting possibilities, be quiet! takes a simple product like the fan to the next level. And with its improved bearing technology, the new SilentWings 2 is going to follow in the steps of and even exceed its hugely successful predecessor in terms of silence. When be quiet! introduced the original SilentWings PC case fan series almost three years ago, it flew to the top of the 'recommended list' for serious users intent on achieving the ideal balance between silence, cooling performance and fan life. Its performance was so superior that several print and online magazines quickly named it their reference case fan. Of course, it's difficult to improve excellent things, so the pressure was really on the R&D team when it started to work on SilentWings 2. In the end, though, the pressure and hard work paid off, for they have achieved the goal of producing a clearly superior product. One key result is the noticeably lower noise level. SilentWings 2 uses the most advanced bearing technology on the market, called fluid dynamic bearing (FDB). The bearing essentially makes the fan float on a cushion of fluid, resulting in extremely low noise levels because there is virtually no friction to create sound. When coupled with the unique aerodynamic fan blade design be quiet! is famous for, SilentWings 2 is virtually inaudible. "SilentWings 2 combines solid engineering, long life and incredible quietness with truly effective cooling. 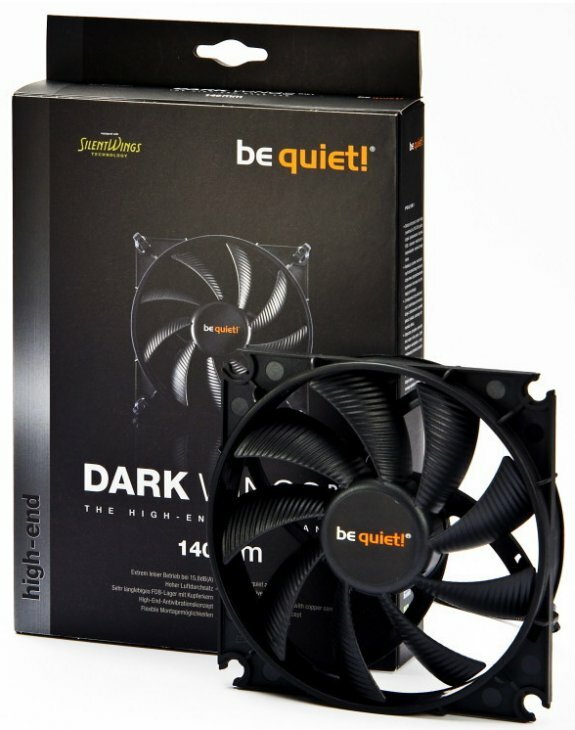 This unique combination of attributes not only makes it a worthy successor to original SilentWings but the superior quiet cooling solution on the market." is how Scott Richards, Global Brand Director at be quiet! announced the new series. Another positive consequence of the new industrial grade FDB bearing technology is much longer lifetime. By eliminating direct contact between the fan shaft and the bearing, the fan lasts much longer than those with common bearings. A copper core inside the bearing makes it even more durable by improving heat transfer out of the bearing. Heavy duty lubricants also contribute to the terrific overall lifetime of 300,000 hours—over 34 years (according to the more reliable L10 standard, not the usual MTBF value)! The included variety of mounting parts makes it is possible for the user to adjust the fan to specific requirements. One can choose between anti-vibration bolts or regular screws for mounting, and even decide on the level of decoupling desired by choosing either a space between the fan and the case or else a flush mounting. For the best silence and isolation, the rubber mounts with space between the fan and the case is ideal. The flush mounting option still also provides very good isolation as the fan will rest on its rubber ring which surrounds the fan. Further, the included voltage adapter for 7 and 5 volts allows the user to customize fan speed. be quiet! 's SilentWings 2 fans are already available in all popular sizes. The 80 mm version costs 12,50 Euro, the 120 mm 15 Euro and the 140 mm model is available for 17 Euro. A 92 mm version will be shipping soon.